Have you noticed that Shakespeare's plays usually have a lot of characters? It's true, and it can sometimes feel daunting to figure out who's who. It's helpful to understand that the characters often come in groups, with different groups being featured in different parts of the plot. Scroll below to meet some of these memorable characters and hear a few of their emblematic lines. Krystin Pellerin as Lady Macbeth and Ian Lake as Macbeth in Macbeth (2016). Photography by David Hou. The protagonist and tragic hero. A brave and powerful soldier whose ambition leads him to commit murders to secure the throne. An ambitious woman seeking power and position who encourages Macbeth to seize the throne. A brave and noble soldier who has ambitious thoughts but does not translate them into action. He is hostile to Macbeth becoming king and will seek vengeance for the murder of his wife. Her domestic life is a stark contrast to Lady Macbeth’s cold and hellish existence. He is the antagonist in the play. He is well-liked and quick to reward honour and loyalty to his subjects. He is also blind to the threat of Macbeth’s treachery. He is named Duncan’s heir and rightful successor to the Scottish throne. He becomes a serious challenge to Macbeth when he joins forces with Macduff. Joseph Ziegler (centre, left) as Duncan and Antoine Yared as Malcolm with members of the company in Macbeth (2016). Photography by David Hou. (From left) Brigit Wilson as First Witch; Deidre Gillard-Rowlings as Second Witch and Lanise Antoine Shelley as Third Witch in Macbeth (2016). Photography by David Hou. Their prophesies will lead Macbeth to murder Duncan and others who stand in his success at getting the crown. Returning from victory on the battlefield where they have crushed a rebellion against King Duncan and invasion from abroad, his generals Macbeth and Banquo are accosted by three mysterious women. These "weird sisters" greet Macbeth as Thane of Cawdor - a title belonging to one of the vanquished rebels - and predict he will become king. But the future successors to the throne, they say, will be Banquo's descendents, not his. Part of this prophecy seems to be fulfilled shortly afterwards, when Duncan rewards Macbeth by bestowing on him the newly executed Cawdor's title; Macbeth's prospect of becoming king, however, seems dimmed when Duncan names his son Malcolm as his successor. Urged on by his wife, Macbeth decides to take matters into his own hands. He murders Duncan as he sleeps, while Lady Macbeth contrives to throw suspicion on the king's own attendants. Fearing for their safety, Malcolm and his brother Donalbain flee, and Macbeth assumes the throne. Fearing Banquo's suspicions, Macbeth orders his murder and that of his son, Fleance - but that deed, far from bringing him peace, has consequences as terrifying as they are unexpected. Haunted by the spectre of his guilt, Macbeth consults the sisters, who assure him that he need fear no man born of woman and that his position will be secure until a nearby wood is seen to move. Meanwhile, as Macbeth's rule degenerates further into a reign of terror, the exiled Malcolm returns with English troops to claim the throne. Too late, Macbeth realizes that the sisters' prophecies are riddled with deadly ambiguity, and that the destiny he has pursued is a double-edged sword, forged by his own murderous hand. The historical Macbeth (c.1005-1057) was king of Scotland from 1040 to 1057. His wife was Lady Gruoch, a granddaughter of Scottish king Kenneth III and formerly the wife of Gilcomgain, Thane of Moray. After Gilcomgain's death in battle, during a revolt against Duncan, Gruoch fled to the neighbouring county of Ross with her son, Lulach. Macbeth, Thane of Ross, became her protector and, in 1035, her second husband. Although Shakespeare portrays Duncan as an elderly man, he was actually under 40 when he was killed - in battle, not in bed - by Macbeth. His sons Malcolm and Donald Bane were less than 10 years old at the time. Macbeth, who reigned for 17 years, was by all reports a good king: under his rule, Scotland prospered and was relatively peaceful until a failed invasion by the Northumbrians in 1053. In 1057, Duncan's son Malcolm Canmore, now a grown man, returned to Scotland and killed Macbeth in a battle in Aberdeenshire - nowhere near Dunsinane or Birnam Wood. Assuming the throne as Malcolm III, he died in 1093. Shakespeare would have seen no reason to question the traditional belief that Banquo's son, Fleance, fled to Wales, where he married a daughter of the Welsh king, and that their son returned to Scotland to become the founder of the Stuart royal line. There is no historical evidence however, that Banquo or Fleance actually existed. If, as seems reasonable to suppose, Shakespeare wrote Macbeth in the hopes of pleasing James I (formerly James VI of Scotland) - who was a patron of Shakespeare's company and had doubled the fee they received for court performances - the attempt misfired. Perhaps upset by its depictions of the assassination of a Scottish king and of witches influencing human destiny, James banned Macbeth for five years. It was produced only once more during Shakespeare's lifetime: in 1611 at the Globe Theatre, which burned to the ground shortly afterwards, destroying all sets, props, costumes and manuscripts - which may be another origin of the play's reputation for ill luck. Macbeth has been considered unlucky since its very first production - perhaps because the text supposedly contains an actual witches' incantation: the famous "Double, double, toil and trouble; / Fire burn, and cauldron bubble." At any rate, the play is notorious for the superstitions surrounding it - so much so that director Des McAnuff began rehearsals for the 1983 Stratford Festival production with an exorcism! It is true that some productions of the play have been marred by fatal or near-fatal incidents. Laurence Olivier was nearly killed while playing Macbeth at the Old Vic in 1937, while in 1942, four people associated with John Gielgud's production died - including two of the actresses playing witches. Most theatre people - even those who are not normally superstitious - observe the rituals that have arisen as a result of the play's reputation. It is considered bad luck, for instance, to mention the title or quote from the play inside a theatre. Actors and staff call it "the Scottish play, "that play" or "Mackers." Macbeth and his wife are referred to as "the Scottish couple." If you break these rules, you are supposed to leave the room, turn around three times, reenter and swear in order to placate the curse. Michael Blake as Macduff (left) and Ian Lake as Macbeth in Macbeth (2016). Photography by David Hou. In this lesson, the students will explore the opening scene of the play which uses a trochaic tetrameter rhythm to create a strong dramatic effect. Ian Lake as Macbeth and Krystin Pellerin as Lady Macbeth in Macbeth (2016). Photography by David Hou. In this lesson the students will explore Macbeth's speech then analyse a scene between Macbeth and Lady Macbeth to gain insights into their relationship. 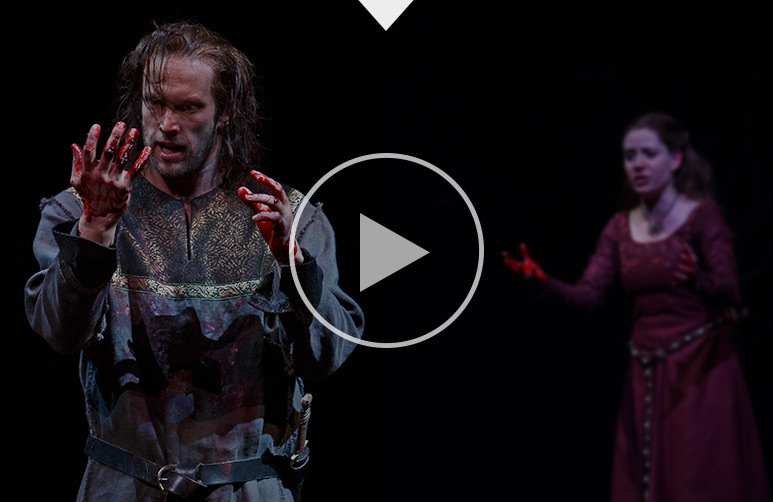 Krystin Pellerin as Lady Macbeth and John Kirkpatrick as Doctor in Macbeth (2016). Photography by David Hou. In this lesson, the students will analyse and search Shakespeare's text for clues and then stage each character's movements and behaviour. Ian Lake as Macbeth in Macbeth (2016). Photography by David Hou. Click here for a list of Macbeth related activities you can complete with your class. Ian Lake as Macbeth with members of the company in Macbeth (2016). Photography by David Hou. 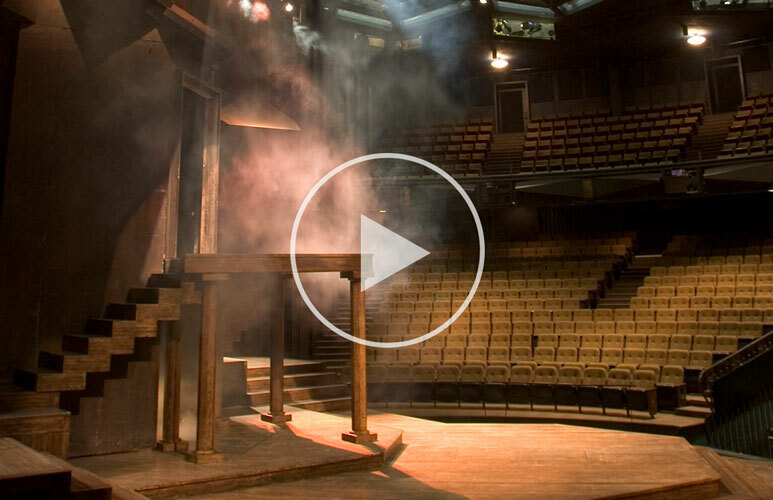 Click here for a list of discussion topics for your class before and after seeing Macbeth.